The grid control room at the California Independent Systems Operator or CAISO. Solar energy records are falling left and right in California these days, as the state steams ahead toward its ambitious renewable energy goals. But the success of solar has brought about a hidden downside: on some perfectly sunny days, solar farms are being told to turn off. That’s because in the spring and fall, when Californians aren’t using much air conditioning and demand for electricity is low, the surge of midday solar power is more than the state can use. It’s becoming a growing concern for those running the grid at the California Independent System Operator. 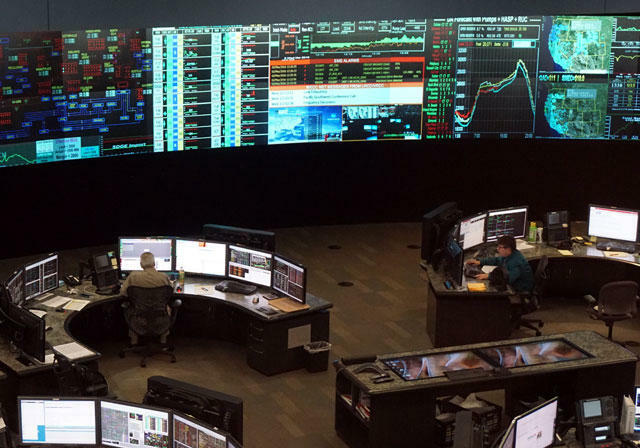 At their Folsom headquarters, a team continually manages the power supply for most of the state, keeping the lights on for some 30 million people. “It’s constantly solving a constant problem, meaning you’re always trying to balance,” says Nancy Traweek, who directs system operations for the grid. On March 27, a sunny day, some solar farms had to shut down because there was more power on the grid than Californians were using. In the past, balancing California’s electric was fairly straightforward. The power supply was constant, coming from natural gas and nuclear power plants that put out a steady stream of electricity. But the growth of solar and wind power has thrown a wild card in the mix. The sun and wind are much less predictable. “All of a sudden you have a major cloud that comes over a solar field,” Traweek says, and that causes the solar power to drop off. “That [power] needs to come from somewhere else immediately,” she says. So grid operators have to keep the natural gas plants running in the background. If they’re turned off, many take four to eight hours start up again. California’s highest demand for electricity also happens right as the sun goes down, when Californians come home from work and lights turn on. Grid operators need natural gas power plants at the ready to meet that peak and to fill the gap that’s left by solar power. But add up all those energy sources – solar, wind, natural gas, as well as hydropower, nuclear and others – and on some days, they’re making more electricity than California needs. So, grid operators have to tell solar farms to shut off. Casey says the problem will only get worse as more solar and wind connect to the grid. California plans to hit 50 percent renewable energy by 2030. California’s grid operator is developing a solution, one that is garnering controversy across state lines. Right now, California’s grid runs mostly on its own, like an island. But there are power lines reaching across the West. So, Casey is proposing California join up with its neighbors. Instead of having lots of electric grids across the West, each doing their own thing, there would be a larger regional grid, sharing power across state lines. When California has too much solar power, neighboring states would buy it, preventing California from having to switch off the solar farms. This marriage of electric grids would start with PacifiCorp, a utility that runs its own grid in Oregon, Utah, Idaho and Wyoming. But PacifiCorp isn’t a partner everyone wants to get in bed with. “PacifiCorp is by far the largest owner of coal plants in the Western United States,” says Travis Ritchie, an attorney with the Sierra Club. In 2014, more than 60 percent of PacifiCorp’s electricity came from coal power. PacifiCorp’s coal power wouldn’t necessarily flow into California. The state’s climate change law, AB 32, means that electricity from other states has a price tacked on that raises the cost of fossil fuels to account for their carbon emissions. But Ritchie warns that joining a regional electric grid, governed across several states with different agendas, could mean giving up some of California’s autonomy. “Will California actually lose the ability lead on climate issues if it gives up its power to Utah and Wyoming, two states that are actively fighting everything about climate change that California is working to promote?” he says. Several state legislators have the same concern. In February, they sent a letter to Governor Jerry Brown raising red flags about the merger. While the Sierra Club is worried about Wyoming influencing California policy, Wyoming is equally worried about the opposite. Linking the California and PacifiCorp grids would require approval from regulators across the region, and as it’s currently proposed, not everyone is ready to give their blessing. “California policies, whether you like them or not, are going to be exported throughout the West, and all of us in the West are going to be importing California policies,” says Wyoming Public Service commissioner Bill Russell. Policies like the state’s commitment to renewables—a commitment not shared by Wyoming, the nation’s largest coal-producing state. Wyoming could potentially benefit from lower cost energy though. A study commissioned by PacifiCorp found that customers across both regions would save $154 to $335 million annually, which is why Russell isn’t dismissing the idea outright. Regional grids like what’s being proposed already exist in the Midwest, New England and the mid-Atlantic, but Western states have resisted similar arrangements in the past. “Politics at the end of the day is the biggest obstacle,” says Cindy Crane, CEO of Rocky Mountain Power, the PacifiCorp subsidiary in Wyoming, Idaho and Utah. Crane worked on some of the previous efforts to integrate the western grid and says this time could be different. If those issues can’t be overcome, the alternative for California is finding a way to store extra renewable energy energy. “Energy storage is probably the biggest hammer in the toolbox,” says Paul Denholm, analyst at the National Renewable Energy Lab in Colorado. Large batteries and other energy storage technologies could store the excess solar energy California is producing during the day. But until prices come down, storage remains costly. Denholm says according to his analysis, California will probably need both storage and a regional grid to reach its 50 percent renewable goal in the most cost-effective way. Other types of energy, apart from solar, could also become more flexible. Many natural gas power plants have signed contracts with utilities that limit how often they can be turned off or ramped up and down. With renewable energy growing at a rapid clip, other states could soon face the same challenges. The California Independent System Operator and PacifiCorp will spend the next two years studying their plan to integrate, as well as making their case before regulators in several states. If the plan moves ahead, the two would join up by 2019. Residential Solar Versus Utilities: Who Wins The Battle Over Net-Metering? The solar surge threatens centralized utilities, forcing states across the nation to search for a new model for electricity rates that works for customers and utilities. Reporter Matthew Frank looks at his own experience in Montana.